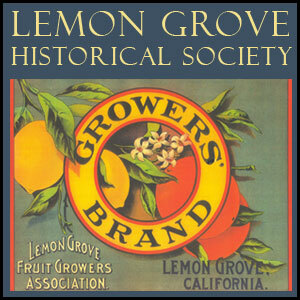 The Lemon Grove Historical Society has an important track record in historic preservation, and takes pride in working with other preservation organizations in San Diego County. Our sister societies do heroic work to save and document local histories. We believe the following organizations deserve special applause. This organization, whose motto is “Unity and Joint Effort,” has promoted the history of our region for more than half a century. Its bimonthly newsletter, “The Adelante,” is essential reading for anyone in preservation. Its annual, two-day conference held on the first weekend in March makes prestigious annual awards and brings together scholars to examine aspects of specific themes. Notable recent examples are “San Diego and the Great War” (2017), marking the centennial of America’s entry into WW I; and “Scandals and Scoundrels” (2016), looking at the rascals whose exploits affected county life in diverse ways. COH is a membership organization. Founded in 1928 by San Diego civic leader George Marston, SDHC has assembled vast collections of photographs, documents, artifacts, furnishings, clothing and ephemera related to San Diego’s story. Its beautiful museum in Balboa Park features imaginative, revolving exhibits. Its quarterly journal is packed with scholarly articles. Its biannual newsletter features this-minute information, and its many public programs draw history buffs from far and near. An example of the latter is “Building to the Next Level: Forum for History Organizations” on Sept. 23, 2017 in which LGHS has played a developmental role. bringing an entire village of Victorian homes to Old Town in 1970. SOHO is a membership organization.